Some of the most difficult travel to book is when a pet is along for the trip. Whether it’s a dog, cat, or gerbil, the lovable bundle of fur in question is no doubt a part of a family, but at times, they are forced to travel as cargo. So how do you book the perfect escape while also ensuring the journey will be enjoyable for furry friends? We spoke to Social Media Manager Becca Barnett from BringFido.com to find out the best destinations, travel tips, and brands for four-legged travelers. A: Depends on personal preference. My dog loves playing in water, so a trip to the lake or beach is always fun for us! Camping suits a dog who loves to run and get dirty, while a more pampered pooch would like to stroll around the city and stay in a luxury hotel. I think the answer would be different for everyone. Q: What are some of the most pet-friendly destinations? A: For the big cities, New York, San Francisco, Chicago, Austin, and Seattle all stand out as pet-friendly. But smaller cities can have a surprising amount to offer dog owners. For example, Asheville, N.C. has 41 dog-friendly restaurants and Charleston, S.C. has 34. For beach loving dogs, San Diego has 40 dog-friendly attractions and 168 dog-friendly restaurants. Our site has information on the dog-friendly hotels, attractions, and restaurants in each U.S. city. Q: What hotel amenities are most important to have when traveling with a pet? A: It’s important to have green space near the hotel, so Fido can have a place to relieve himself. You’ll also want to be aware whether or not the hotel allows you to leave your dog alone in the hotel. Sometimes this can pose an issue for guests who just want to step out for a moment. If the hotel provides food/water bowls, you’ll know they really value your pet. Finally, it’s a good idea to seek out dog-friendly restaurants nearby. The great thing about BringFido.com is that all pet policies are listed upfront and guaranteed. Also, the BringFido app is valuable when traveling because it uses your location to find the closest dog-friendly restaurants and attractions. You can filter the search to include hotels that allow big dogs or multiple dogs. Q: What are some of the best pet resorts you’ve seen/stayed in? Are there certain hotel chains that are better than others? A: Many boutique hotels really roll out the red carpet for pets. A couple of brands that do so consistently are Kimpton and Loews. A canine ambassador welcomes you and your pet at each Kimpton property, and every Loews hotel offers a gourmet room service menu just for pets. In our book Ruff Guide to the United States, we highlight a host of hotels around the country that offer unique pet amenities, including doga (dog yoga) sessions, canine massages, guided pet-friendly hikes, and even a dog-friendly limousine service! Q: BringFido has reviews from all over the world. 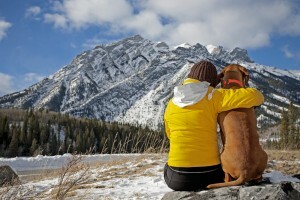 What do travelers need to know when booking a vacation with a pet and going overseas? What do they need to be aware of, legally-speaking, when traveling abroad, especially if there are necessary quarantine times, or who they should reach out to in specific circumstances? A: Policies are quite varied depending on the country. We usually recommend that an individual contact the embassy directly to find out about necessary vaccinations, quarantine periods, and the occasional breed restrictions while in the planning stages. You can find contact information for these embassies at travel.state.gov. Q: What are some steps pet-owners need to take before leaving on vacation? Do they need to check with their pet’s vet? A: You should have a copy of your pet’s vaccinations on file while traveling. Also, it is of upmost importance to know your dog’s behavior. An out-of-town trip is not the time to introduce your pet to children or other dogs for the first time. Also, the number on your dog’s tag should be your mobile phone. It’s not helpful for a good samaritan to call your home phone when they find Fido wandering alone in a different state. Q: What are the best airlines for pets? Are there airlines that stand out as pet-friendly and accommodating relative to their peers? A: We list airline pet policies on our site as well. American Airlines and Southwest are rated the highest by our users. Fortunately, airlines are understanding more and more how important our pets are, and they are working to make flying more pet-friendly. Delta has implemented digital monitors for pets held in cargo. For a fee, the pet owner will be able to see their pet’s surrounding temperature and position within the crate. There are several limitations to this feature. For starters, due to cell phone restrictions it seems that one would only receive updates from the monitor while the plane is grounded. Secondly, Delta is only offering this at a limited number of airports (last I heard, 10 airports). However, we hope these tests grow to be fully inclusive and permanent. Q: What is some absolute necessary information pet owners need to know before traveling that we haven’t mentioned? A: Here are some of our top tips! Exercise your dog before a long trip so Fido can rest while in transit. On road trips, keep your dog hydrated and plan to make appropriate stops, so your pooch can stretch his legs. Bring vaccination records. Also, make sure your dog has proper identification with a contact number where you can be reached en route. Bring familiar toys from home to comfort your furry companion. Download the BringFido app so you can find dog-friendly hotels, restaurants, and attractions while on the road. Grow your business with our expert tips!